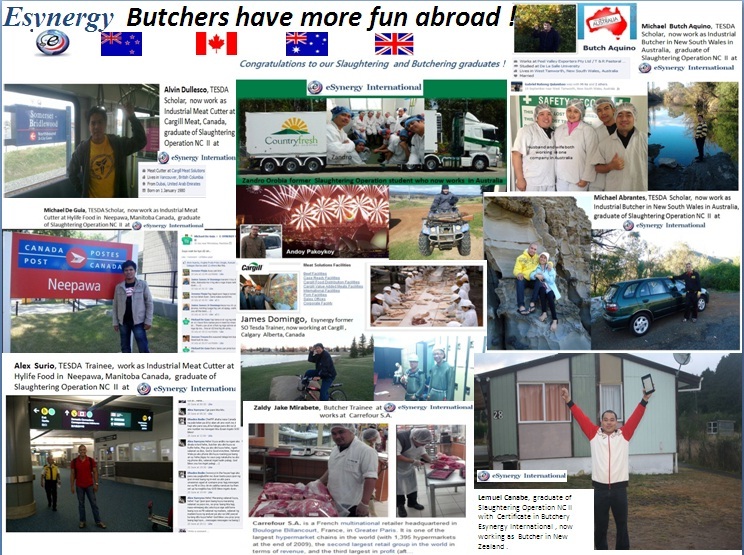 Esynergy Butchers Have More Fun Abroad ! eSynergy International is the country's TOP Producer of World Class Butchers. Our graduates are preferred by foreign employers and manpower agencies hiring for abroad. We are the pioneer in developing innovative and world class butcher training programs where we have elevated Butchering as a Science, a Craft and as a Professional Occupation. We are the shakers and movers of the industry and we continue to lead the way as innovators in training. 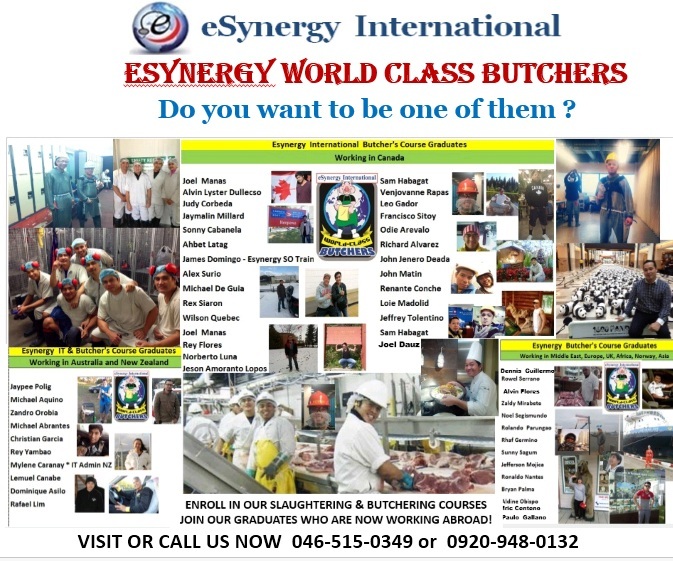 It is eSynergy's MISSION to help Filipinos acquire professional skills in butchering, meat processing and production and help them get into the highly in- demand butchering occupation worldwide. We are committed to help improve their lives and make a difference. As the leader in butchery training, WE are passionate in teaching our students not only the physical aspect of butchering, but we do our best effort to mold and shape their best asset- their Minds and Hearts during the duration of the training. This helps prepare them as World Class Butchers who can compete with confidence and work proficiently in various international environment. 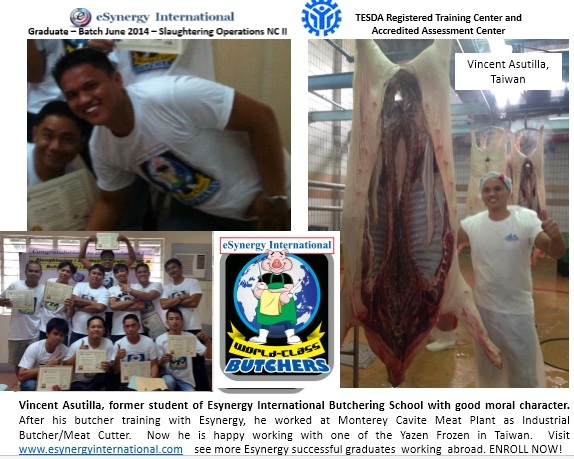 Why eSynergy is the TOP BRAND in Slaughtering and Butchering Training? eSynergy International was awarded the Global Brand Award as the Best Producer of World Class Butchers in 2015 by Asia Pacific Council. It was also nominated as Best Butchering School in 2016. Esynergy Interntional was also awarded the prestigious Best Brand Award in 2010 due to professional training standards, excellent customer service, professionalism etc. We are officially registered as a TESDA training Center and as a TESDA Assessment Center. We have passed all the strict requirements of TESDA to be approved as a center under ISO_9001,with strict quality assurance in venue and facilities, accredited trainers, quality curriculum, proper area in square meters, professional background of the staff and people managing the company, etc. Our student admission, lectures, and hands on training is held in a reputable meat plant and visible office address and managed and staffed professionally full time. 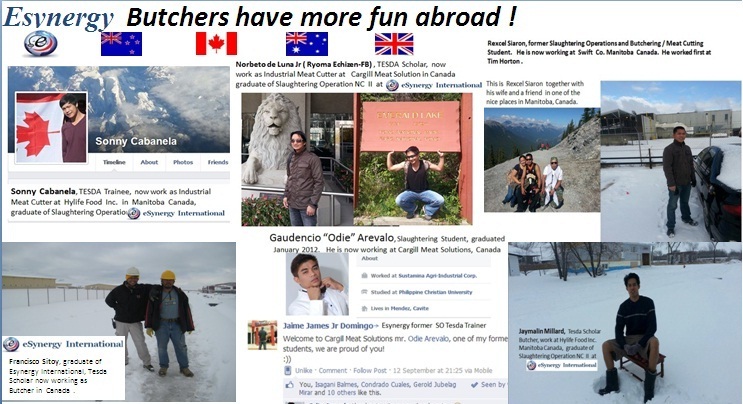 We have many graduates now working abroad. 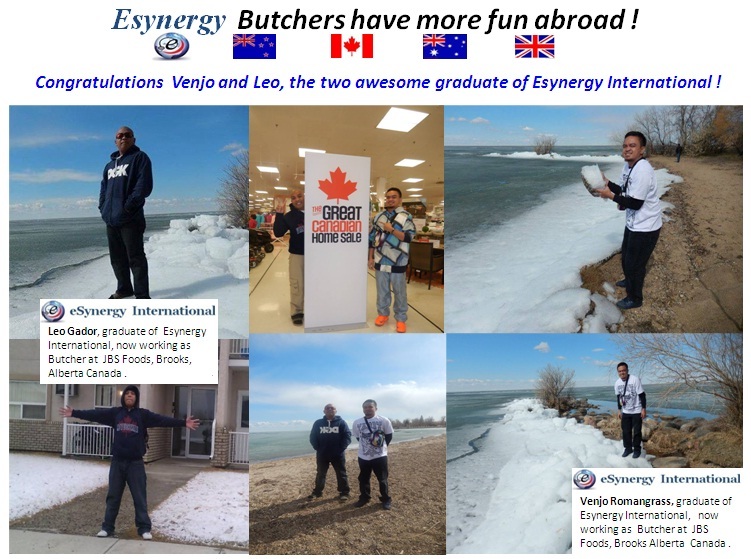 They are our pride "Esynergy World Class Butchers"
Congratulations to all eSynergy graduates who are now working abroad! 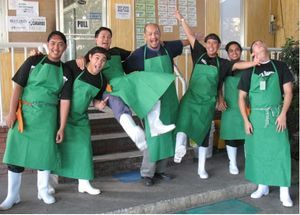 Be a Certified Industrial Butcher / Meat cutter and work in one of the highly paid in demand jobs ! techniques of meat cutting, using tools and equipment and environment similar to the ones used abroad. Note: eSynergy is a Tesda Training Center and not a recruitment company. This course is designed to equip individuals with operational knowledge, skills and attitudes in slaughter/abattoir operations. It deals with all the processes involved in slaughtering pig /or cattle on the process used overseas as well as in large companies in the country. This is an intensive one month Certificate in Retail Butchering with Meat Cutting and Meat Processing actual hands on training for those who would like to work as Meat shop/ Retail Butcher/Meat cutter. This is recommended also for those who had taken the NC II-in Slaughtering/Abattoir course and wants to further learn butchering and have the edge over other applicants in order to be highly qualified abroad. It includes international techniques in primal, barrel and retail cuts, and de-boning. Due to the high demand of these skills, slots are limited so please enroll early. photo copy of your valid id. 2nd flr., Abacast Bldg.,Nueno Ave., Imus, Cavite ( walkiing distance from Lumina mall, Aguinaldo hiway, beside Lotus Mall and MetroBank Imus. Today’s meat industries in Canada Australia, New Zealand, UK and Europe are multi- billion dollar businesses due to their continuous growth from consumers who are meat lovers and enjoy eating beef steak, barbecues, bacon and other processed meat products and from the export of their products to USA, Japan and other European Countries. While their huge meat industry enjoys continuous growth yearly, these companies face manpower shortages due to the retirement of workers who reach 60 years old, which comprise 30% of the workforce. The lack of interest of their younger people to work in meat processing aggravates the manpower shortage because most of them prefer white collar jobs in sales,IT, admin, and other glamorous jobs. Some meat processing plants in Canada and Australia have even closed operations due to the serious lack of manpower. Meat processing in advance countries is an integrated operations meaning most large companies own:1) 1)farms, the 2) cattle or swine(pigs), goat or sheep in the farm,3) the abattoir plants where slaughtering/ butchering takes place,4) the meat processing where the carcass are further cut and processed into beef/ pork cuts, fillets, steaks, barbecue cuts, ham, bacon, & other processes meats. The processed meat are distributed/marketed to groceries & supermarkets which the large companies usually own. Hence, while working as a butcher can be a good entry point to be employed in these companies, there is also a great career opportunity to move or be promoted to other positions in various departments like meat processing, admin or grocery staff or sales. Working as a butcher can be very rewarding financially for immigrants or workers because the salary ranges from twenty four thousand to forty six thousand dollars yearly depending on the workers experience, plus other benefits, training, etc. incentives. According to TESDA, there is an estimated shortage of 10,000 butchers / and meat workers in these countries which are needed to be filled up, especially so that large companies have started hiring again due to the vigorous international market demand. 2. Relatives of Immigrants or citizen’s who will be petitioned by their relatives through the family category or provincial nomination which only takes an average of 1 year in processing. 3. Immigrants whose visa are already approved and will leave in a few months time who wants to be hired and start working immediately. 4. Relatives of immigrants who can b hired as butcher/abattoir worker through a work visa or company sponsored visa. 5.People who willing to work in Australia, Canada, New Zealand, UK or Europe as butchers/slaughtering workers as their occupation entry point. 6. 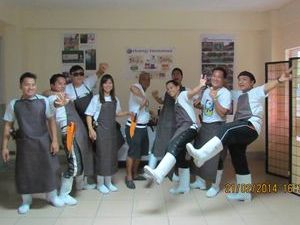 Graduates of NMIS-BAI slaughtering course who lack the practicum time, and who needs TESDA certification. 7. Butchers with local experience or those in the meat business who wants to learn the scientific way of this trade and earn TESDA certification & be able to work abroad. 8. People planning to set up a meat business which is very profitable. 9. Graduates of Nursing, Caregivers, Agriculture, VetMed,Animal Science or Culinary Arts whose course/occupation can be aligned with a a career entry in overseas meat industry as as slaughter person,grocery butcher or meat cutter or abattoir worker. 10. People who loves the challenges & the outdoors , or loves to work with their hands and takes great pride in their work output. ENROLLMENT IS GOING ON ! Just fill up our inquiry form ! It has been a great experience training at Esynergy. They ensure that I will learn and possess the skills that I needed before the training duration ends. What I paid for is worth it ! 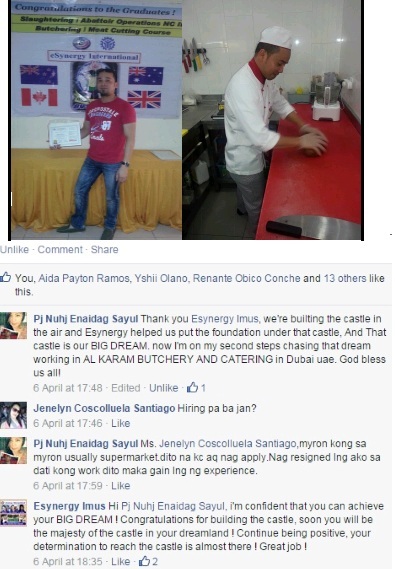 They have very comprehensive international standard and Tesda Curriculum that a World Class Butcher should have. Many thanks to our Tesda Certified Trainers, Jeff Rellosa and Michael Darvin, and to all management and staff of Esynergy International for their very hands on approach. More power and God bless ! "Good day! I am very thankful to Esynergy International Training Center because I have learned some additional skills to support my knowledge, and this training is great help for the challenging job which I will handle very soon. Thank you and God bless!" 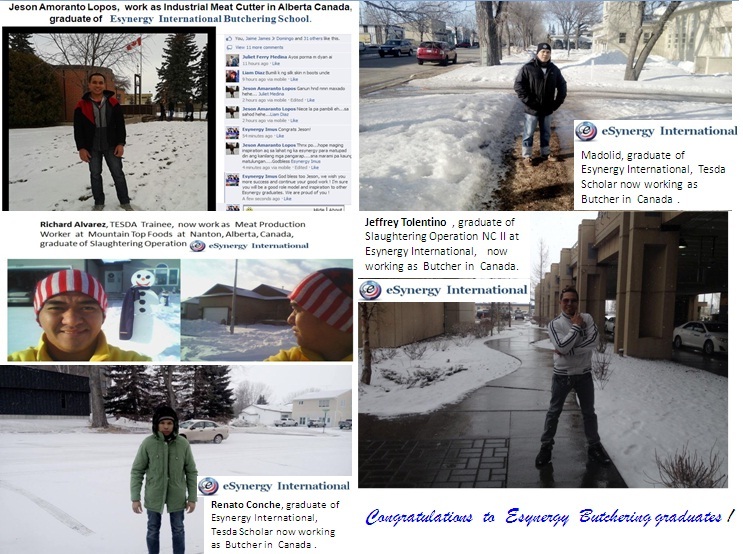 "I would like to thank Esynergy International for everything that I have learned during my short stay in this institution. I have given the opportunity to realize my potential and dreams to be a Slaughtering Operation Butcher. This training made me infinitely better than having done it on my own. " "Esynergy is one of the good training centers that I have encountered. They have good and approachable personnel and Trainers. In Esynergy everything that need to be learned will be taught depending on your specialization. They have complete training equipment and they ensure the safety of their students. I had so much fun with them and I can say that my hands on training made me completely trained and I gained more knowledge about Slaughtering Operation." 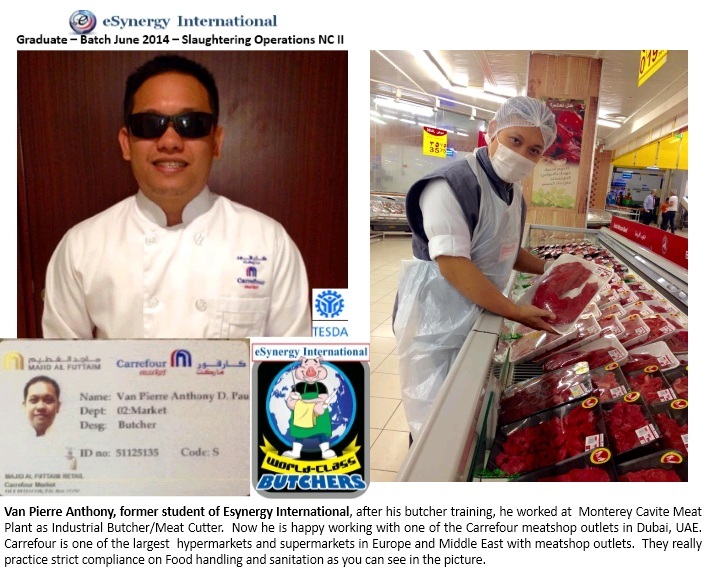 "Before, I thought I don't have opportunity to grow and have my career, I used to just stay home because I don't have any work but when I attended eSYNERGY Butchering and Meat Cutting Training, I realized that there are many opportunities waiting for me being a Butcher Trainee graduate, I just need to strive and earn experience after my training and afterwards apply to Canada or Australia just like the many graduates of Esynergy. ?Grabeng intensive ng training ng eSynergy, at lahat ng Butchering Techniques natutunan ko!!! ?I would like to thank everyone at eSynergy Intl. Butchery School for giving me the proper training in my butchering skills. Thanks for the great job because lahat natutunan ko at magagamit ko sa Sweden. I would not hesitate to endorse your company. Marami pong salamat? Ok and training ng eSynergy Intl. I learned all the butchering techniques based on international standards. Ok sa akin and training nyo and I will endorse you!! Congratulations to Cads,now with Magsaysay managed floating hotel!! Congratulations to Marvin who is now in New Zealand! !